Bing is providing new insights to advertisers with the launch of its Bing Ads Marketplace Trends Interactive website. The website provides access to interactive charts that include Bing Ads campaign trend data to help users better plan and strategize their campaigns. The three types of charts include insights for device targeting, ad scheduling and location targeting. The device targeting trends chart, for instance, includes both cost-per-click (CPC) and click-through rate (CTR) data for PC, mobile and tablet devices. 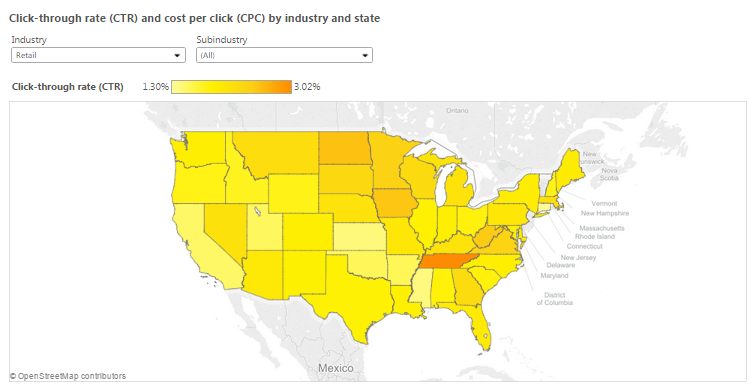 Conversely, the ad scheduling trends chart enables users to find the best time of day and week for advertising on Bing Ads, while the location targeting trends chart displays CTR and CPC data on a state level. What’s more, users can filter all charts by industry and subindustry to view specific trends. It is important to note that this release comes after Bing unveiled a new data visualization for advertisers last month, which explores both reach and demographic data from its network. With both of these tools, advertisers are better equipped to make advertising decisions based on real and up-to-date data.